Providing you the best range of MDT Electro Hydraulic Thruster Brake with 18kg Thruster, Electro Hydraulic Thruster Brake with 34kg Thruster, 18kg Electro Hydraulic Thruster ST 520, 34kg Electro Hydraulic Thruster ST 535 of Speed-O-Control, Speed-N-Systems, Anand, Stromkraft, Electromag, Speedage, Pethe, Duplex, CMK, Electro power and Kakku. 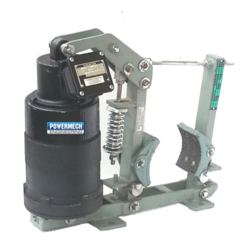 Electro hydraulic thruster brake is supplied to suit various make of cranes such as Anupam Cranes, Amsak cranes, Armsel cranes, Apex cranes, Atlas cranes, Ankit Cranes, Abus cranes, Cranetech cranes, Cranex cranes, Craftsman, Demag cranes, Dynamech cranes, DC Hoist Cranes, Electromech cranes, Elmech cranes, Esquare cranes, Forum cranes, Grip cranes, GH cranes, Hercules Cranes, HAFA cranes, INDEF, Intelle cranes, K2 cranes, Krans Cranes, Loadmate cranes, Magna cranes, MM Engineers, Mukand cranes, Mega cranes, NE cranes, Powermech Cranes, Reva cranes, Recmann cranes, Sigma Cranes, Sun cranes, Swaraj cranes, Street cranes, SL cranes, Stahl cranes, Sri Pranav Cranes, Unicon cranes, Viralishanmuga cranes, WMI cranes, Unitech, and many more. Application EOT Crane, Overhead Crane, Gantry Crane, Moving machinery and Electric hoists. 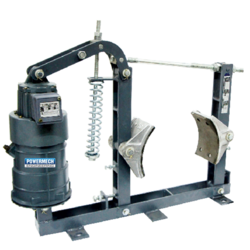 Electro Hydraulic Thruster Brake is used to retard the speed of moving machinery and to stop it accurately to the desired position. The breaking force is applied to the brake shoes by a pre—stressed compression spring. The brake shoes press on the rotating brake drum retarding its speed, and finally stopping it. Other release devices like pneumatic / hydraulic cylinder or manual release arrangements can be offered on request. ■ The tie rod transmits the spring force on the shoes by a simple lever system. ■ One or more springs are used depending upon the brake size and thruster capacity to obtain the desired braking torque. NOTE: Price shall vary for each model / type, specifications and other terms. Please mail us to get quotation for the required product. Note: We also supply Thruster brake assembly with 18kg Thruster in CAST IRON BODY. Please look under “Electro hydraulic thruster brake with 18kg Thruster. 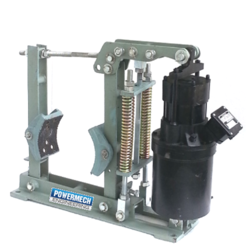 Electro hydraulic thruster brake is supplied to suit various make of cranes such as Anupam Cranes, Amsak cranes, Armsel cranes, Apex cranes, Atlas cranes, Ankit Cranes, Abus cranes, Cranetech cranes, Cranex cranes, Demag cranes, Dynamech cranes, DC Hoist Cranes, Electromech cranes, Elmech cranes, Esquare cranes, Forum cranes, Grip cranes, GH cranes, Hercules Cranes, HAFA cranes, INDEF, Intelle cranes, K2 cranes, Krans Cranes, Loadmate cranes, Magna cranes, MM Engineers, Mukand cranes, Mega cranes, NE cranes, Powermech Cranes, Reva cranes, Recmann cranes, Sigma Cranes, Sun cranes, Swaraj cranes, Street cranes, SL cranes, Sri Pranav Cranes, Stahl cranes, Unicon cranes, Viralishanmuga cranes, WMI cranes, Unitech, and many more. In addition, Thruster of 46kgs, 68kgs, 114kgs are also supplied suitable for other size of brake drum given below. Spare brake shoe with liner, brake drum with coupling is supplied on request. In addition, Thruster of 46kgs, 68kgs, 114kgs are also supplied suitable for other size of brake drum. Brake shoe with lining is supplied for all type of EOT Crane Brakes and Industrial brakes such as Thruster brakes, Electromagnetic Shoe type brakes and Electromagnetic Drum brakes. Brake shoe is generally supplied in Cast Iron body. On request, the same is supplied in Aluminium Die Cast. Brakes shoe with lining is supplied to suit as per drum diameter/models of brakes for Thruster brakes, Electromagnetic shoe type brakes, Drum brakes and Solenoid operated brakes used in Cranes and Hoists. Brake shoe shaft / Brake Pin is also supplied on request. Brake lining (metallic impregnated) asbestos based and Non-asbestos based brake lining in required is also supplied. Brake shoe with lining is supplied to suit various make of cranes such as Avon hoist, Amsak cranes, Ankit Cranes, Apex cranes, Armsel Cranes, Asian Cranes, Atlas cranes, Brady & Morris hoist, CHPL crane, INDEF, Intelle cranes, Electromech cranes, Esquare cranes, Grip cranes, Garlick Cranes Jaico hoists, Krans Cranes, Magna cranes, Reva Cranes, Rope master hoist, Sigma hoist, Sun cranes, SL cranes, Shrushti Cranes, Sri Pranav cranes, Saico Cranes, Shrusti, Sriram Engineers, SWIFT crane, TAK hoist / cranes, Viralishanmuga cranes, Unitech. Also, Brake shoes are supplied for various make brakes such as Speed-O-Controls, Speed-N-Systems, Strom kraft, Electromag, Pethe and for other brakes. suitable for use in steel and rolling mills, lifts and elevators & cement and concrete plant machines. Moreover, these thrusters are tested on numerous quality parameters to ensure their world class quality and flawlessness. Additionally, offered thrusters are designed and developed as per the requirements and specifications of our respected customers. 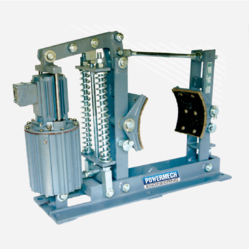 Synchronizing mechanism ensures equal drum-liner clearance. 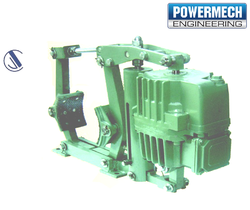 Looking for Electro Hydraulic Thrustor Brake ?